October is Breast Cancer Awareness Month and several businesses are donating a portion of their sales to breast cancer charities and there are several breast cancer events happening. The Locale has the La Reina De Mis Sueños which features lime juice, gin, hibiscus syrup and dashes of firewater bitters. $14 and $2 from each cocktail goes to Susan G. Komen. Ouzo Bay – Mastiha Mojito which features strawberries, lime juice, simple syrup, and Greek Mastiha Liqueur, garnished with mint. $10 and $2 goes to Boca Regional Hospital cancer programs. Yakitori Sake House – Five Star Cocktail which includes Three Olives Raspberry Vodka, lime juice, Chambord, strawberry puree. $12 and $2 goes to the Morgan Pressel Foundation (also available at Saiko-i Sushi Lounge & Hibachi. Localgreens – Pink Lemonade Popsicle which includes a hand-crafted blend of strawberry and lemons. $3 and $1 goes to Susan G. Komen. Rack’s Fish House & Oyster Bar in Delray Beach will donate $2 per cocktail for every Paradise Found Cocktail. Taverna Opa – Pink Cosmopolitan which includes Citron vodka, Cointreau, cranberry and fresh lime juice. $7 and $2 from each drink goes to Susan G. Komen. Avocado Grill locations in West Palm Beach and Palm Beach Gardens will donate $2 for every Watermelon Lemonade cocktail sold. Downtown at the Gardens in Palm Beach Gardens will donate 10% of the proceeds from their carousel rides for the month. Palm Beach Sandals will offer $20 off four styles of breast cancer sandals with $20 per sale going back to Komen South Florida. Cuts for a Cause at In the Grove Hair Studio, Delray Beach: Hair Cuts, Park Lane Jewelry, Jeunesse Health & Beauty, Mini Spa Treatments, Raffles, Lite Refreshments. Portion of proceeds to benefit Komen South Florida. Wacoal America Fit for the Cure, Dillard’s at Treasure Coast Square Mall: For every woman who gets a professional bra fitting, Wacoal will donate $2 to Komen. An additional $2 will be donated for every bra sold. Wacoal America Fit for the Cure, Dillard’s at The Mall at Wellington Green. For every woman who gets a professional bra fitting, Wacoal will donate $2 to Komen. An additional $2 will be donated for every bra sold. Making Strides of Indian River, Riverside Park, 3001 Riverside Park Drive, Vero Beach. Registration starts at 7 a.m. Pitch for the Cure – Lake Catherine Park in Palm Beach Gardens. Raised $7k last year. Hosted by PBGYAA. Starts at 8 am with the first pitch to survivors. 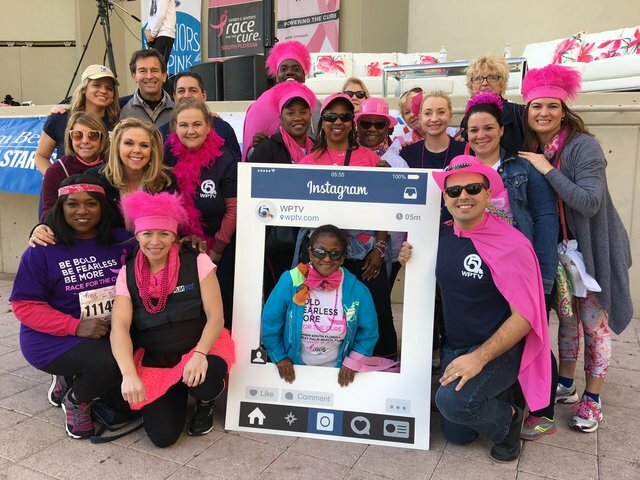 Making Strides of South Palm Beach – FAU Campus, 777 Glades Road, Boca Raton, Sunday registration starts at 6:30 a.m.
Sip & Shop – The Wyndham Grand Jupiter at Harbourside Place will turn pink from 1:30 to 4:30 p.m. One hundred percent of the $60 ticket price and its silent auction proceeds will support Komen South Florida. Guests will enjoy pink cocktails and light nibbles as they peruse gorgeous boutique gift items and a silent auction filled with spa, cuisine, travel and entertainment experiences. Tickets are available at www.komensouthflorida.org. Think Pink – Breast Cancer Awareness Event – An evening of food, drinks, raffles, door prizes, and life-saving education. Palm Beach OB/GYN from 4 p.m. – 7 p.m. 4671 South Congress Ave. STE 100b, Lake Worth, FL 33461. Wacoal America Fit for the Cure, Dilliard’s at Indian River Mall: For every woman who gets a professional bra fitting, Wacoal will donate $2 to Komen. An additional $2 will be donated for every bra sold. Making Strides of St. Lucie County – First Data Field at Mets Stadium, 525 NW Peacock Blvd, Port St. Lucie registration starts at 7 a.m. The Great Pink Challah Bake – In honor of Breast Cancer Awareness Month, Sharsheret and Myriad will be offering educational resources. BRCA screening and testing will be available. Please bring insurance cards. Plus Doors open at 2 p.m. for screening, baking begins at 3 p.m. Meyer Preparatory – 5225 Hood Road, Palm Beach Gardens. $36/person | $275 for a table of 8. Pink attire optional. Downtown’s Go Pink – Visit local restaurants and stores from Boca Raton to Jupiter in support of Susan G. Komen South Florida® and October’s National Breast Cancer Awareness Month. The most popular avenues in four Palm Beach County cities will become destination hot spots by offering special discounts and items to help raise funds for local life-saving breast cancer programs and research to find a cure. Participating cities include Harbourside Place, Jupiter; Downtown at the Gardens, Palm Beach Gardens; Clematis Street, West Palm Beach, and Downtown West Palm Beach; Atlantic Avenue, Delray Beach; Mizner Park, Boca Raton. Boca Raton – Mizner Park (including Dubliner Irish Pub and Kapow! Noodle Bar. ). Delray Beach Atlantic Avenue (including Brulè Restaurant, C. Orrico, Dada Restaurant, Katcha-Ride Delray Beach, Office 55 and Sara Campbell Boutique are all donating various percentages of their day’s sales to Komen South Florida). Jupiter – Harbourside Place (including Another Broken Egg; Burger Fi; Calaveras Cantina; John Craig PonTiki Boat Cruises; Tommy Bahama; and Wyndham Grand Jupiter ). Palm Beach Gardens – Downtown at the Gardens (Ceci Palm Beach at Downtown at the Gardens will offer a percentage of their day’s sales). West Palm Beach – Clematis Street (The West Palm Beach Brewery & Wine Vault will donate the proceeds from the sales of its first 100 Pink Beers and Kapow! Noodle Bar on Clematis Street will also participate in a special way). Warriors In Pink Celebration: Join emcees Jennifer Ross from Sunny 107.9 and Tracey St. George from 97.9 WRMF to celebrate the announcement of Komen South Florida’s 2019 Warriors in Pink. Music by DJ Jack “Flash” Gonzalez. Wacoal America Fit for the Cure, Macy’s at The Gardens Mall: For every woman who gets a professional bra fitting, Wacoal will donate $2 to Komen. An additional $2 will be donated for every bra sold. Wacoal America Fit for the Cure, Macy’s at Town Center Mall: For every woman who gets a professional bra fitting, Wacoal will donate $2 to Komen. An additional $2 will be donated for every bra sold. City of Boynton Beach Tennis Rally for the Cure: City of Boynton Beach Tennis Center from 9 a.m. to noon. Making Strides of Martin County, Memorial Park, 100 E Ocean Blvd., Stuart, registration starts at 7:30 a.m.
Making Strides of Palm Beach, Myer Amphitheatre, 104 Datura Street registration starts at 7 a.m.
Sip & Shop at Sara Campbell Delray Beach: From 4 to 8 p.m. take 10% off regular priced items with 10% of sales going back to Komen South Florida. Cost: $99 per treatment. For each Pink Wellness treatment booked, $5 will go toward the American Cancer Society to support Breast Cancer Awareness. Revitalize and Rejuvenate with Bioage MD: Offering three advanced treatments for $99/each, the personalized techniques and treatments promote anti-aging and wellness. BIOAGE MD will donate 5% of all proceeds collected from to the American Cancer Society. Cost: $99. 25% of the net proceeds will be donated to the American Cancer Society. The Power of Pink Scrub: Sip a glass of Rosé Prosecco in The Breakers’ private outdoor courtyard while enjoying a fragrant foot ritual soak to gently exfoliate and soften your skin, followed by a relaxing reflexology massage. Cost: $80. 10% will be donated to the American Cancer Society. Cost: $25. 10% will be donated to the American Cancer Society. Cost: $99. 10% of proceeds will be donated to American Cancer Society. Cost: $99. 10% of proceeds will be donated to the American Cancer Society. Peaches & Dream Wellness Treatment: Sit back, relax and unwind as your arms, shoulders, neck and back are warmly nestled and prepped for a cucumber Fresca-infused massage with a steaming towel wrap. Enjoy a deep-tissue kneading massage with a personalized blend of peach, ginger and blackcurrant extract. Cost: $99 per treatment. $5 from each treatment goes to the American Cancer Society. Cost: $99. 10% of sales go to the American Cancer Society. Think Pink Mani/Pedi (80 Minutes): Recognized in Condé Nast Traveler’s Top 100 U.S. Resort Spas, SiSpa is a seaside sanctuary that specializes in “Comfort Care Classics,” a selection of services specifically designed for guests being treated for or recovering from cancer. This October, SiSpa [marriott.com]is offering an 80-minute Manicure and Pedicure that consists of gentle exfoliation, massage, nail cleanup and polish. Also included is pink bubbly or pink lemonade, with a full day access to the resort’s private beach, pools, Jacuzzi, and complimentary valet parking.